Babies sell quickly. A deposit will hold the baby of your choice. We raise many more species than what is listed for sale at this time. Call 623-266-3991 or email Dee at dee@azparrots.com or gerry@azparrots.com. All babies are wonderful and special. Sometimes it is hard to decide which is right for you. we will honestly recommend the best fit for your lifestyle. 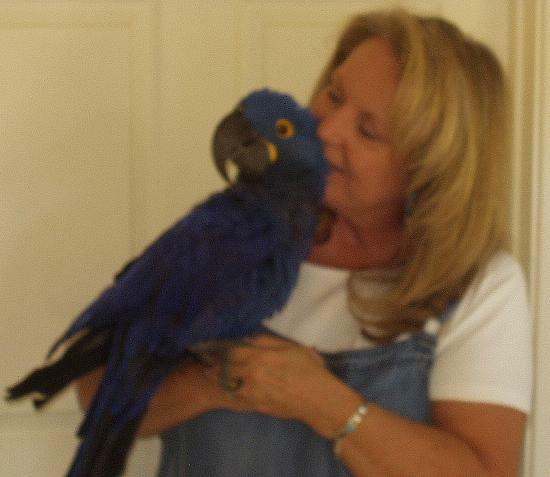 BLUE & GOLD MACAW: Big, but not so big as to intimidate you, this is a great choice for a first time macaw owner. Our sweet huggie bears love being with their people. They will follow you all over the house and delight you as they explore and find new ways to entertain you and show you their love. Usually quiet, considerate, and easy to please it is no wonder these birds have earned their popularity as one of the most desirable family companions in the Macaw family. With 33 Inches of variations of metallic, aqua-blue, and pastel blue with yellow/gold breasts these beautiful Macaws are one the most splendid, graceful creations of nature. GREENWING MACAW: Big and delightful, Greenwings’ are devoted, lovable teddy bears in bright feathers. If you have the space and the confidence for the second largest size Macaw you can’t go wrong with one of our huge Greenwing babies. Our beautiful babies are so extremely personable and lovable that everyone can play with them from grandchild to grandparent. Beautiful to behold and a delight to cuddle, our babies have the typical outgoing clownish “never meets a stranger” personality with an “always thrilled to meet you” attitude. Our babies are equally sensitive, snuggly, intelligent, affectionate, curious, gentle, entertaining, and lovable. With all that personality and their beautiful Ruby colored body, green wings, and individual facial stripes they will steals your heart away and you’ll not want it back. HYACINTH MACAW: Vibrant, gentle, intelligent, devoted, etc. All adjectives that describe this incredible macaw, but none do them justice. Indisputably the Giant of the pet parrot family, these big lovable Indigo babies become the center of their owners’ world. They are all heart and giggles. Loving and hugging for as long as you’ll let them and then playfully chasing your feet around the room the next. Hyacinths are both clowns and royalty in one gorgeous package. If you ever get to interact with a Hyacinth you will find it easy to understand why their owners unhesitatingly agree that they are worth every penny. RED FRONTED MACAW: Splattered in an indescribable color pattern of reds and oranges, blues and greens they look similar to the endangered Thick Billed Parrot. 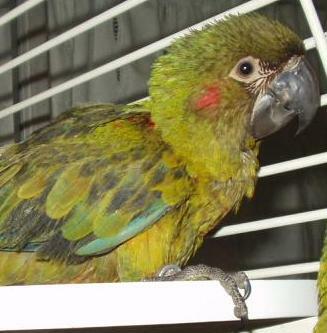 The smallest of the full size macaws at 21 inches, these medium size clowns have a fluffy appearance like a Hyacinth, with the same soft, silky feather texture. Red Front Macaws are known for being outgoing and playful along with being one of the most talkative macaws. Standing on the back of your sofa a Red Fronted will roll down into you lap without warning and lay there waiting to have a tummy tickle. 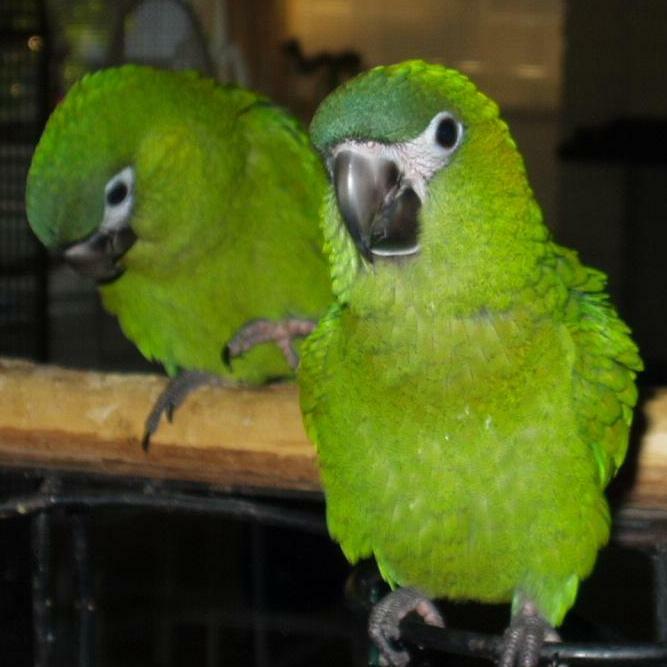 Their clownish personality and cuddly nature have put them much in demand and a favorite with macaw owners. Red Fronts don’t fully color out until about 2 years of age. A wonderful reference concerning Avian Hybrids in nature is Handbook of Avian Hybrids of the World by Eugene M. McCarthy. CAMELOT MACAW: Camelot macaws come in an array of clear, vibrant colors, and all are stunningly beautiful. Watching a Hybrid macaw as it exposes its’ colors and patterns is very intriguing. Most Camelot’s chests are orange, red, yellow or a combination of colors, often laced with yellow flecks. Their parentage of Catalina and Scarlet gives them a feistiness tamed a little from the one-forth Blue and Gold parentage. CATALINA MACAW: Originally referred to as a Rainbow Macaw the Catalina can be found with slight variations of color and size. They range in color with gold-yellow to orange-yellow chests with backs, wings, and head in shades of blue and green. Their Blue and Gold and Scarlet parentage gives them a long, sleek body and very long tail. Similar to the Harlequin in color, they are often misidentified as Harlequins until their feisty Scarlet temperament gives them away. FIESTA MACAW: Sprinkles of yellow and orange confetti on brightly colored various shades of blue and green wing feathers gave this hybrid its’ name. Gentle and quiet, the Fiesta looks and acts like the party has started and you are invited. A cross between our Yellow Camelot and his beautiful Harlequin mate, a Fiesta has all the best traits of each parent. More yellow appears as the babies mature, imitating their father. All so far have been females. A sweet family bird, Fiestas are about the same size and shape as a Blue and Gold. HARLEQUIN MACAW: Harlequins have become the most sought after of the Hybrid Macaws largely because of their stable, sweet temperaments and their devotion to their owners. Our large Harlequins are stunningly beauty with their rich, bright orange chests and striking clear intense color. Babies have the devoted personality and size of a Greenwing coupled with the sweet gentle, clownish nature of a Blue and Gold. A charming video of a Harlequin and Fiesta playing together can be viewed at this site courtesy of owners Kim and Louis of Tucson , AZ. PHOENIX MACAW: Delicate and gentle, the colors on these babies are vibrant and crisp. Each baby is unique. Thought the colors may vary slightly the dispositions are the same; sweet, gentle and devoted. Each baby is one of a kind with distinctive feather and color patterns of yellow, blue and green primaries, usually a red forehead and a brilliant bright green head. With just a tad of Scarlet in their parentage for vibrant color and lots of Greenwing for playful devoted adoration, and a sprinkling of Blue and Gold for grace and gentleness, they have inherited all the best features and disposition of their heritage. QUATRO MACAW: Extremely intelligent and quick to learn our Quatro baby is a happy collage of color. No two babies from our pair have been identical. The former owners of the parents of this baby called them quatro because each parent is such a mix that the babies are all unique. This baby is blue where most are green, with an orange chest and a kaleidoscope of colors in his wings. Exceptionally sweet and gentle he is also inquisitive, with a playful nature. Show him a trick or a stunt and he picks it up with immediately! HAHNS MINI MACAW: The smallest of the mini macaws that we raise, these 13 inch little tiny bundles of energy are either hiding in your clothes with just their huge eyes and tiny beak showing over the top, or up on your neck rubbing their face on your neck. Hahns are happy entertaining and exploring on their own when you are not available. Most learn to talk in tiny voices; a real benefit if noise is a factor. Hahns are such a delightful little bird, and so family friendly, that many of our bird owners come back for a second one. SEVERE MINI MACAW: The larger of the mini macaws at 18 inches, Severs are inquisitive, curious and a little bit shy. They are known to be excellent talkers, with sweet, playful attitudes. They may prefer one family member over the others but they will play with everyone. More laid back than the smaller Hahns they love one on one and learning to do tricks. Devoted family birds, they thrive when involved with family activity. YELLOW COLLAR MINI MACAW: One of the harder to find mini macaws, their bright yellow collar give these 15 inches babies their distinctive appearance. Shiny dark green feathers with a black brow Yellow Collars love to perform for you. They are very curious, playful and vocal. Most develop extensive vocabularies if talked to when they are young. 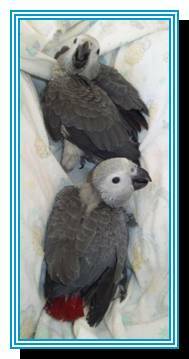 CONGO AFRICAN GREYS: The king and queen of conversation, our little sweet fuzz balls come from large, beautiful, sweet, outgoing, intelligent, lovable parents. Their babies have been just like them. Congo Greys are known to be more devoted to one person in a family than to all, but they are tolerant of everyone and actually miss family members even if that person is not their primary caregiver. RED BELLIED PARROT: Known for their exceptional personality and notable speaking ability, Red-Bellies seem to be the best talkers of the Poicephalus genus, speaking not only clearly, but with understanding, and often in more than one voice. 10 inch delights with grey heads, red-orange tummies and aqua legs and tail area. They are outgoing and playful, yet they appear to be shy and pleasantly unconcerned. The end result is a cute, sensitive, sweet and vulnerable quality that is difficult to describe and hard to resist falling in love with. Not often available. SENEGAL ORANGE BELLIED PARROT:Little charming 10 inch delights with grey heads, green wings and orange tummies, Senegal’s are the best known member of the Poicephalus family. Senegal’s love to be petted and taught to do tricks. Compact, cuddly and very playful, they can be the center of attention, without being demanding. Quiet enough to live in an apartment, they are very gentle and sweet and speak with a clear enunciation. TIMNEH GREY: Sweetness and light, little playful delights, Timneh Greys are little enchanters. Timnehs are considered by some to be a bit more snuggly than their larger cousins with the same excellent ability of speech. Our little coddlers love to play, talk and whistle. This is a great choice for a smaller, quiet pet with a big heart. JARDINE PARROT: Easily one of the most beautiful and entertaining of all the African parrots. They love to learn to talk and do tricks. Their intelligence is only rivaled by their beauty. Brilliant bright green with red or orange foreheads. Red laces the feathers on their legs, peeks out from under their wings, and rims the edges of their wings. Their white eye patch gives them an alert gentle appearance. Bigger than the Timneh and smaller than their Congo cousins, they, like Congo’s can become a one person pet if not held and played with regularly. Their playful personality thrives with lots of toys to explore and chew. Also known as Red-fronted Parrots, Red-crowned Parrots, and Fig Parrots. MAJOR MITCHELLS: Major Mitchells are so beautiful they can’t be good pets….right. Not so if raised from the time they are babies to play daily with their human family and other bird species. As adults they don’t love for their feather to be roughed up so people think they are aloof. Sounds like most Congo Greys. As adults they enjoy being with their human and like being held and hugged. Major Mitchells are naturally gentle and inquisitive and make delightful companions if you like a bird that is not demanding, is quiet, beautiful and gentle. They do best if your family will continue to cuddle and play with them daily. Also known as Leadbeater's cockatoo or the pink cockatoo. CITRON COCKATOO: Beautiful and seldom available, Citrons are especially sweet, with great big expressive eyes, a beautiful big orange crest and soft white feathers. A Citron Cockatoo looks absolutely regal, poised like Royalty. Babies are the delight of their owners with all the cuddles and hugs you could ever want. Never intimidating, Citrons are known for being quiet, less demanding, and playing independently on their own. In spite of their shy, quiet charm this is a great bird to teach tricks to as they learn so quickly and love the spotlight. ELEONORA SULPHUR CRESTED COCKATOO: Sometimes referred to as the Medium,are social, good natured, active, acrobatic, and have a sunny disposition. They talk some, make an excellent companion, and are not considered to be as needy as some of the other cockatoos . 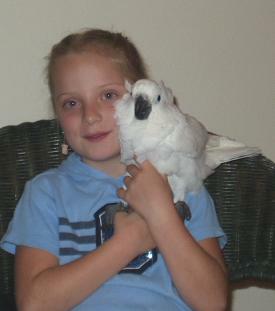 GOFFIN COCKATOO: Little sweet fluffs of charm, a Goffins smaller size and snuggly personality make them a perfect choice for a family who wants a smaller cuddle bug with good speaking ability. Tons of affection in a little package, Goffins are a delightful bundle of hugs and activity. Give Goffins lots of toys, a swing and tons of love and affection and they will give it back in delightful explosions of amusement. LESSER SULPHUR CRESTED COCKATOO: White with a yellow crest and cheek patches a deeper yellow. Their underwing coverts and under-tail feathers are yellow. Excellent as pets, they are approximately 14 inches in length. Lessers are very loving and affectionate but tend to be a little shyer than other Cockatoos. Some do bond to one person more than the entire family. Highly intelligent, like most cockatoos, they need constant stimulation with toys and objects to chew to keep them from getting bored. They are not generally noisy. Rose Breasted Cockatoo: Little rose and silver babies with adorable large eyes and smiling faces, quiet little Rosys are sure to win your heart. Endearing, sweet and peaceful, they often talk quite well. Rosys enjoy all members of the family and strangers. Rose Breasted Cockatoo are reported to be the only Cockatoo species that is raised after weaning in nursery trees, supervised by adult nanny birds. In captivity Rosys seem to really appreciate the nurturing that they receive in their first years without becoming demanding as adults. UMBRELLA COCKATOO: The big Teddy Bear bird. Umbrellas are family orientated. When raised correctly by their breeder and placed with a family who does not hug them 24/7 when they are babies, which is easy to do, they retain their enjoyment of playing independently. Give you Umbrella lots of stimulating activity, time to play independently, and involve them in family activity. If you do you will have a funny, delightful, entertaining, lovable friend for life. They love to dance and mimic songs so play, play, play. Cockatoos “self cleaning action”: Most parrots have oil glands to groom their feathers but Cockatoos have varying degrees of white powdery “talc” that keeps their feathers groomed and clean. This powdery substance can prose a problem for people with respiratory problems. Misting or bathing daily along with a good filtering system will help alleviate the powder. BLUE FRONT AMAZON: Amazons are all known for their excellent talking ability. Most sing, dance and mimic sounds. Like all Amazons Blue Fronts are comical and entertaining. The Blue Front Amazon is known as one of the most dependable, gentle, and quiet of the Amazon family of birds, and is rated third as one of the best talkers. They are very beautiful 14 inches of soft blue to green feathers with red at the bend of their wings. DOUBLE YELLOW HEADED AMAZON: Beautiful, bright yellow from forehead to back of their heads and throat distinguish the double yellow headed Amazon. Red on their shoulders and a bright green 15 to 16 inch body gives them a very striking appearance. Very social and an excellent talker, they love to perform in song and dance to an audience. LILAC CROWNED AMAZON: Happy sweet, even tempered entertainers, the beautiful Lilac Crowned is known to be one of the gentlest and quietest of the Amazons. Great in a family environment as most share their attention with all family members. When raised from a baby domestic Lilac Crowns usually develop large vocabularies. PANAMA AMAZON: (A. panamensis) Rarely available. 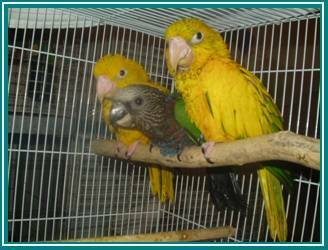 The Panama is known for being one of the finest pet birds available and most desirable to have as a member of your family. They have small patches of yellow on the front of the forehead, are brilliant shades of greens all over, and just slightly smaller than other members of their species. The most even tempered and docile members of their group, they are known for their intelligence and talking ability. YELLOW NAPPED AMAZON: Know as one of the best talkers and show offs in the Amazon family, these birds are prized for their ability to “record” and “play back”. 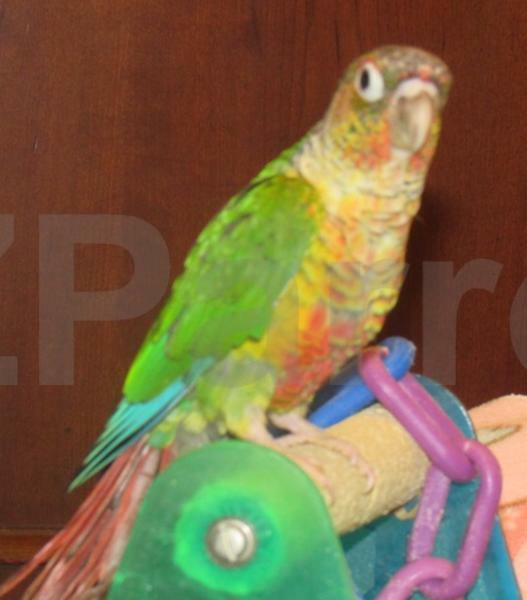 A great choice for someone who want to stimulate and train a bird to talk or do stunts. Both the Double Yellow and Yellow Nape thrive with companionship and challenging interaction. 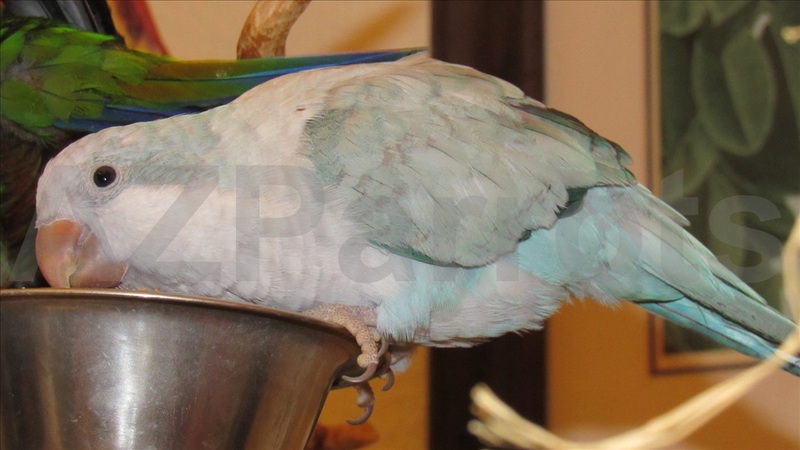 BLUE CROWN CONURE: Known for being gifted talkers this is the star of the movie POLLY. Gentle, beautiful, playful and intelligent are some of the words used to describe these little 12 inch bundle of cuddles. 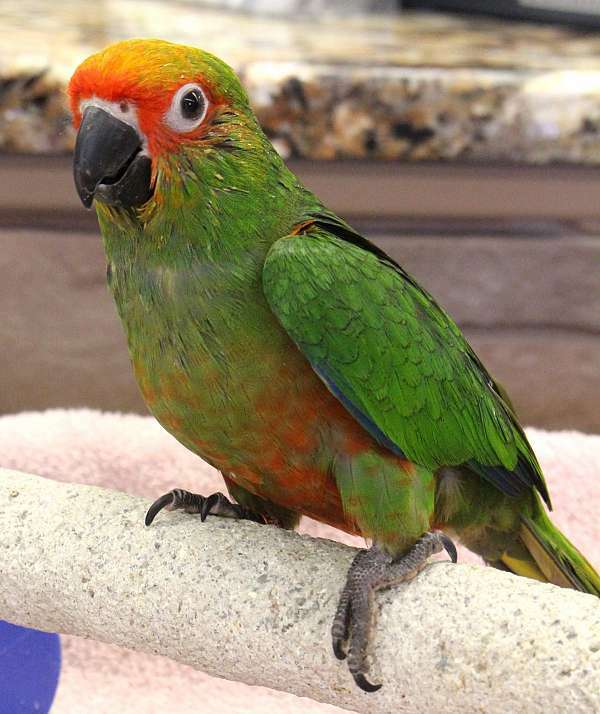 Very social, and quieter than most conures, Blue Crowns bond closely with their human families and thrive with mental stimulation and activity. They enjoy interaction but play quietly by themselves. WHITE BELLIED CAIQUE: Incredibly inquisitive these cute little 9” clowns in their yellow and green PJ’s behave like little wind up toys; active one minute, cuddly the next. They possess all of the traits and antics that make Caiques one of the most charming sought after small bird companions. The White bellied has yellow thighs with bright orange feathered heads, brilliant yellow chins, and snowy white breasts. They look as if they are dressed like miniature clowns. Everyone who is owned by a Caique raves about their charm. BLACK HEADED CAIQUE: The same delightful little clowns in cute PJ’s as the White Bellied, just with a black head instead of an Orange one. The only reason they cost less is because their parents produce more babies. HAWK HEAD PARROT: Hawk heads are remarkable pets with an “other-worldly” appearance. One of the species most distinctive behavioral characteristic is to raise the dark red and blue scalloped feathers on their necks when expressing themselves; framing their faces like a Native American war bonnet. Extremely intelligent, they learn tricks and words quickly. They love to entertain and are real “show off’ birds. Devoted to their human companions they are not demanding but love attention. As babies they will tickle you one minute with their silly antics and then fall asleep on their back in your lap. BLUE QUAKER: Beautiful and oh so adorable and cuddly. Our soft little Wedge wood blue “wind up toys” win the hearts of all they meet. With their big expressive eyes and endearing personality they are great “tuck in your shirt and take with you” friends. Quakers are usually excellent talkers, and so affordable we considerate a Quaker to be the best bird “bargain” anyone could ask for. This is a perfect bird for anyone intimidated by larger beaks. GREEN QUAKER: The same cuddly little character, just green instead of blue, this is the “normal” color of a Quaker. ECLECTUS: We raise three sub species; Vos Marie, Red Sided, and Solomon Island . Eclectus are wonderful and never enough babies to meet our requests. We began our study of Eclectus in the early 90’s and have devoted an entire section to describing their personalities and identification. 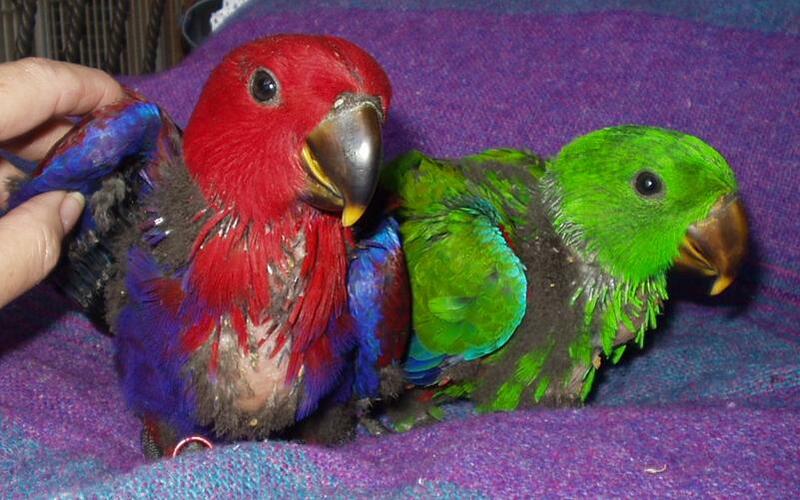 Go to the “Help Files” at the bottom of each web page and select ECLECTUS BASICS. Pictures of our babies on Saturdays with visitors can be viewed by clicking on BIRD BUDDIES at the bottom of the page. Raising Parrot Babies and taking care of their parents is our full time commitment. We have just a few babies at the time and we give them the devotion, attention, and security vital to instill the skills needed to develop into exceptional, socially adaptable companions with a balanced, mentally healthy outlook that will sustain them as adults. Babies are members of our family and are rocked, cuddled and talked to by us and our experienced friends and family of various ages from the time they are 6 weeks old until they come to you. Families need to be ready to receive their baby when baby is at the perfect moment of opportunity to transfer their affections. This is when your baby will study your face with wide trusting eyes and still be dependant on you for safety. He will be weaned and able to fly but like a toddler wants the security only his new family can provide. We ship weaned babies under the conditions most favorable for them.